FREE WiFi and Telephone for landlines throughout Europe ! ! 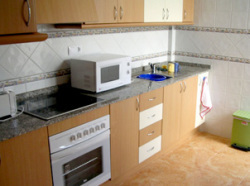 Superbly maintained Villa/Townhouse to rent in Gran Alacant, Alicante, Costa Blanca, Spain. 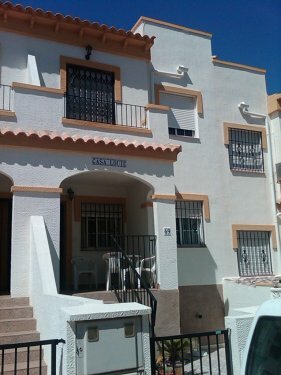 Wonderful Sea Views, 100 yards to pool, 2min bus to beach, Free WiFi, Satellite TV, All Amenities in walking distance incl Markets,NEW supermarket 5min walk, 30 bars and diners. Carry Cots and Hi Chairs. Local Gym 5min walk . 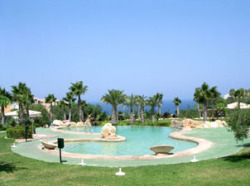 Personal Training , Fitness Breaks, and Fitness Holidays in Spain can be arranged as part of your visit. 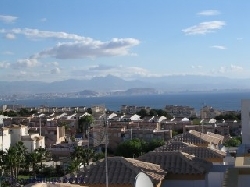 Situated south of Alicante, Gran Alacant is a new development overlooking the sea, on the Costa Blanca. 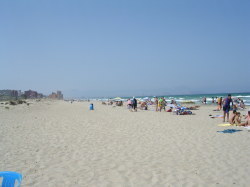 The golden sandy beaches of Arenales del Sol are wide and bordered by dunes and just 700 metres away. The wonderful scenery and beaches will encourage you to enjoy the Mediterranean climate that prompted the World Health Organisation to describe it as "One of the healthiest places in the World in which to live". Close by (500metres) is the Clot de Galvany nature reserve. Santa Pola, 3km south of Gran Alacant is a traditional Spanish fishing town. There are five main beaches, a harbour and plenty of seafood restaurants and other cuisines. A large market is held in Santa Pola on Saturdays and Mondays. Just a short ferry journey away is the Isle of Tabarca. Ferries run about every 30 mins. 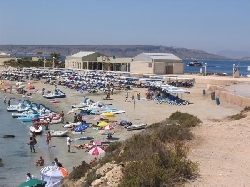 Santa Pola lies just twenty kilometres south of Alicante and is very easily reachable either by car on the National highway N-332 or by air when landing at the Altet Airport just 8 kilometres away. The Castillo ( Castle) de Santa Barbara, Alicante. This should be the first stop on a tour of Alicante and is a perfect way to get your bearings, while admiring views of the town and coastline. Huerto del Cura (Elche)...This fascinating botanical garden within the great palm forest of Elche is perfect for shady relaxation after a few hours sightseeing. Take the scenic Costa Blanca Express between Alicante and Denia for great views and glimpses of small town life; or hop on at night and have a dinner up the coast from your resort. The Express takes you to Benidorm where you will find " Water World" amongst other many attractions. 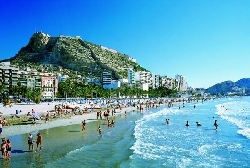 Alicante is a must for visiting. A mixture of modern and historic attractions with a wonderful Marina. Check out the nightime markets. Sunshine 350 days of the year !! 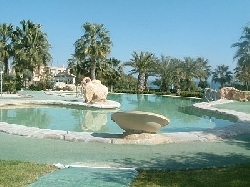 Santa Pola, Alicante, Los Arenales, and the San Juan Beach nr Alicante Town is a must to visit. Drive up and down the coastline and you will find a different beach everyday. For that boat ride take a trip to the Tabarca Island, Benidorm Island or the Islands of Mar Menor. Take in a fiesta, be it in the pre-Lenten "Carnaval", the Holy Week processions, a Moros y Christianos parade commemorating the Reconquest or a summer firework display, check out the locals and local adverts for the nearest festival. Local market ? and admire the produce, smell the flowers and buy a picnic and a paella pan. You will find a market somewhere local everyday, check out local details when you arrive !! Discounts on Multiple weeks Please ask. 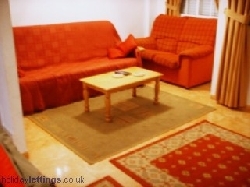 E50 euros cleaning charge based on 2 sharing. E60 euros cleaning charge based on 4 sharing.